In 1959 I bought a Coat of Arms from a firm in York, England, which had run an ad in an American magazine. I had first written the firm to see if they had one for the Mixson family. Some days later I was advised that their own records did not list the name, but after checking with the British Museum they were advised that the following description of Arms belonged to the Mixson family. "Or, a chevron gules between three trefoils vert. Crest - A trefoil vert. Since the price was modest, I sent them my check and after some weeks I received the plaque with the Coat of Arms emblazoned on it. Some few years later a MIXON friend of mine living in an adjoining state advised me he had a similar experience, had ordered from the same firm and received a Coat of Arms with same description. (This one for MIXON). Many families through the years have displayed a Coat Of Arms, presumably without tracing their lineage back to the original holder of the Arms and verifying their right to display same. 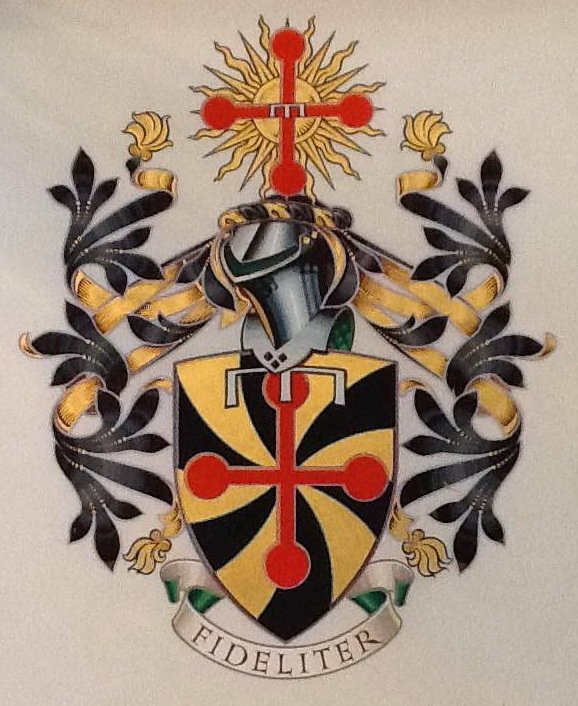 I could not do this for my own line, therefore, I took the matter up with the College of Arms in London. They advised me that if I could prove descent from an ancestor who lived in this country during or prior to the Revolution who had emigrated from England, I could receive a grant of Arms. This I did, and a grant was made to me and my descendants in 1969. I was very grateful. "Gronny emobowed of twelve Or and Sable a Cross pommy Gules And for the Creston On a Wreath of the Colours In front of a Sun Or a Cross pommy Gules ". You will find on the Internet the following Mixon Coat of arms which I am not sure of the orignal source but it is not the one John Leslie Mixson reigistered. All descendants of George Mixon (Mixson) of Beaufort County, North Carolina, and all descendants of his two brothers, William Mixson, Kershaw County, SC , and John Mixson of Darlington District, South Carolina (and of his son, Micah Mixon, Darlington District, SC ) are eligible to become members of the SAR or of the DAR, as the case might be, also could qualify for a grant of Arms from the College of Arms in London.